French duo Nicolas Mahut and Pierre-Hugues Herbert plan to pay tribute to victims of the Paris attacks during the ATP World Tour Finals in London. The end-of-season event gets under way on Sunday, with more than 250,000 spectators expected across eight days. Security is under review but the same measures are in place as last year, when the venue was on high alert. Jamie Murray opens play at the O2 Arena alongside doubles partner John Peers at 12:00 GMT on Sunday. "It's obviously a terrible thing that's happened," said Murray. "It's affected so many people and I guess there are a lot of shockwaves around the world that something like that can happen." At least 128 people were killed in attacks carried out by eight gunmen and suicide bombers in the French capital. 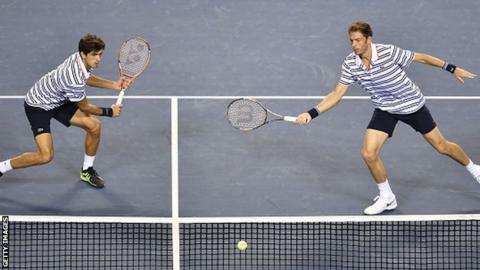 Mahut, 33, and Herbert, 24, are making their debuts at the season finale for the best eight teams in the world. They will play Croatia's Ivan Dodig and Brazilian Marcelo Melo in their opening match at 18:00 on Monday, and hope to reflect events in their home country. "We are discussing with the ATP to do something, at least to wear something on the shirt," said Mahut, who lives in Paris. "We didn't talk with the other players but I'm sure they will do something. That is the only thing we can do and have a thought for the families, and let the politicians do what they have to do." The ATP confirmed "enhanced security" is in place and preparations continue as normal, reminding spectators that bag searches will be in place and no food or drink can be taken into the O2 Arena. The French pair watched events unfold on television in London and Herbert said they were "still in shock" on Saturday. "Right now are thoughts are with the victims, the families and the guys fighting to get peace and Paris secure again," he said. Having confirmed that his friends and family - who live in Strasbourg - were safe, he added: "I'm one of the lucky people, but it doesn't matter because I feel really, really touched by what is happening right now in France. "When it happens in your country I think the feeling is even worse. I mean, I'm scared right now. "Yesterday we were quite happy, it's the first time for us here working in a kind of euphoria, and then you get a message, a call, and from one second to the other you're scared, you feel bad about what happened in France. "Right now it's tough to realise because I think we're still in shock and afraid of what's happening." While the pair still plan to play in London, Mahut said "tennis comes second now" after confirming his friends and family were also safe. He said: "Of course we were scared but I think that's what they want. "It's not easy to talk about what happened right now. I just talked to the family and friends - I had some friends who were having dinner in the Bataclan area last night. "At this moment we should be having fun playing the World Tour finals but today it's really complicated for us." The World Tour Finals is the season finale for both singles and doubles, with world number one Novak Djokovic taking on Japan's Kei Nishikori at 14:00 GMT on Sunday, followed by Roger Federer against Tomas Berdych at 20:00.